Forget about roads not travelled, there's an increasing number of debates I've not been contributing to. The travails at the Poetry Society (details are all over the web but here's one of the more reliable summaries) seem sad, because small organisations can have an impact far beyond their size, and good corporate governance is as important here, as it is at News International. The devil makes work for idle boards to do it seems. As neither subscriber to Poetry Review or member of the Poetry Society, its the kind of club that brings out the Groucho in me, but I'd hoped at some point in the future, as a poet at least, to have some nodding acquaintance with either. As for the Booker longlist, announced yesterday, its the old and the new, as ever, and it increasingly seems the novel's top contest is as open as a Golf major in the post-Tiger Woods days. (Tigers do well in the Booker by the way, so its not a totally spurious analogy!) Great to see small publishers on there, again. I've not read any of the books, so I can't really comment. I have a sneaking suspicion that the "big names" might not make it to the final six, if only because quite a few of the new books seem quite interesting and original in subject matter (if not in style.) A judging panel including the ex-head of MI5 and the writer of "The Woman in Black" is likely to be going for a good story or two, I'd think. What's clear - or has been for a few years - is that there's no new broom to the Booker, no new generation of writers taking all before them, and proclaiming the irrelevancy of those that have gone before. History features strongly, as ever, the Indian subcontinent seems to have fallen a little out of favour (or maybe it's just this year), and there's a welcome return to the list with Jane Rogers indepedently published pseudo SF novel. I like the Booker, its quirks, its annoyances, and spits and spats - and also its occasional ability at picking out some of the better books of the year. I've read 7 of the last 9 winners, but only one ("Wolf Hall") genuinely seemed the best of the bunch. I'm at a "writing residency" today, for 2 and a half hours at least. This is part of a project called The Reading, and takes place in the Untitled Gallery, which is a tiny room underneath the Friends' Meeting House in Manchester. 72 writers are contributing and I'm following on from Kay Boardman, who I don't know, who may well be (one Google search later, so may not be!) an editor of a book on "Popular Victorian Writers". So, all being well, from 12pm I'll be avoiding the sunshine and the jazz festival and sitting at a screen waiting for inspiration - my words being simultaneously broadcast to the Cornerhouse and other venues about town. Best keep it clean then. 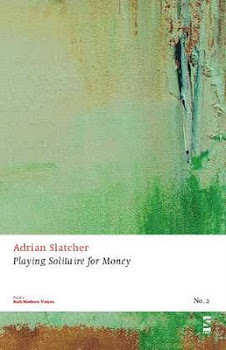 Tweet me at @adrianslatcher if you've any words you'd like me to inculcate into the text and reception willing, I'll see what I can do! The Manchester International Festival finishes today, and although its a bit difficult to be objective, given that few people will have been to more than a couple of shows, because of the cost and the variety, it seems to have been another success. There were tickets still on sale as late as yesterday afternoon for the remaining shows - which, though surely not ideal, at least let people make choices after the reviews came in. I popped into "11 Rooms" at Manchester Art Gallery yesterday - I simply hadn't found time and opportunity before - and the place was packed, and indeed closed its doors early. Performance art, that mainstay of TV comedy skits on art, has clearly come of age. Maybe it was already there... David Blaine in a box, or the hourly stints on the 4th plinth at "One and Other." I don't think I'm being elitist when I felt that I didn't want to be crammed into a small space watching this or that performer. The performers I have seen this last couple of weeks - Rickie Lee Jones, Paul Heaton, Lonelady - have been of the musical variety. In each case, although seeing them live seems a privilege it is the work that got me there. Classic albums from Rickie Lee (she took us through her first two albums in the order they were recorded), familiar songs from Lonelady, a brand new ensemble piece by the Beautiful South frontman. I could (and perhaps should) have gone to something every day and night this week, but I've had to limit myself. In all of this "performance" you wonder where anyone gets the time to do any work nowadays. Bjork apparently doesn't speak for a day after the performance; yet everyone's been hoping to "star spot" round town, as if seeing someone outside of their show, drinking beer in Albert Square or coffee in the Cornerhouse, is somehow a more authentic experience. After all, its no surprise that you might bump into Damon Albarn out and about, as he's garrisoned in Manchester for a few weeks. The more authentic experience, of course, is the performance; but even more than that - it's the creation of the art, and that, so often happens outside the performance space. This piece appealed to me on a number of levels. Firstly because it is about writers doing what they do, usually in silence and isolation. Secondly because of its democratic nature - which has appealed to a wide range of Manchester's writing community. And thirdly because the chance to sit down and write something in "residency" even for just a couple of hours, feels a real privilege. In other words, it amazes me that any work at all gets done these days, so inculcated are we in the primacy of performance. As a poet, as a well as a fiction writer, I know how long it can take for a poem to make it from first draft, to being ready for the world, to being published. For our art, I think this has implication, in that its only when a book or record or film is completed that the world sits up and takes notice. Our instantaneous culture is one of over-production, yet for an individual artist or writer this is so difficult. No wonder there's a trend in the art world towards minimalism, it's all people have time for. Anyone who is interested in contemporary art can find themselves invited to previews every week of the year - yet it is the silent contemplation on a wet Wednesday afternoon that offers the real communion with an artist, just like the real communion with a writer is in private, with the work. Anyone who has sat there uncomfortably as a friend asks to read your latest poem knows how irrelevant your presence is to the reading - after all the "presence" is all in the work. All art is performance, but when everything is performance, I fear a little for the art. Dragging myself away from the News International scandals (and trying to wonder why since everyone I know has been suspicious of the "Digger" and his nasty little newspapers for as long as I remember, the political class are only just realising it. Reminds me (as many things do) of the tale of the frog and the scorpion).... as I say, dragging myself away. In Birmingham on Monday I had a long-overdue visit to the magnificent city Art Gallery. As well as sitting there enthralled by Epstein's "Lucifer" I spent some time with their pre-raphaelites, read about the progress of the Staffordshire hoard (which was dug up a couple of miles from where I grew up), and had lunch in the wonderful Edwardian Tea Rooms. The real reason for going was to see the "Home of Metal" exhibition in the basement. Something strange hearing Black Sabbath, Diamond Head and Napalm Death in an art gallery. Birmingham's attitude to culture always seems a little ambiguous. I looked in vain in Waterstones for any Roy Fisher. Still writing at 80, he seems a nearly invisible figure, even in the city where he came from. I'm writing about the West Midlands - partly about my own past, but partly the landscape, partly trying to uncover the somewhat hidden literature of the city - and it strikes me that there remains a literary hole of sorts, despite the usual preponderance of literary festivals etc. The Lichfield festival this week has brought in Carol Ann Duffy and Gillian Clarke as the main poetry event. The recovery of the Staffordshire Hoard reminds us that Mercia was once a powerful kingdom. I wonder what its "national" literature would look like? There's a sense of overstimulation elsewhere as the Manchester Festival continues in the city. I've hardly had a chance to see the main events, never mind the fringe, though was so glad I went to see one of my musical heroines, Rickie Lee Jones, on Sunday night. 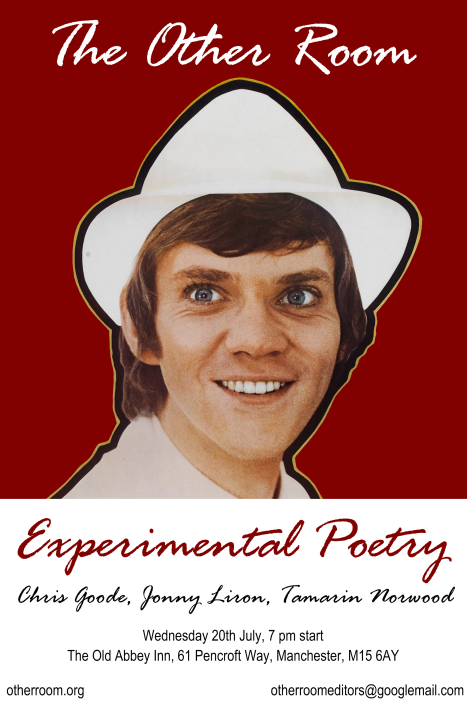 There's quite a lot of static on the poetry airwaves at the moment. Like buzzing fly at the window I can't quite ignore the furore over the Poetry Society/Poetry Review whilst realising that it has little relevance/resonance for me, either as a poetry reader or writer. Poets, despite the popular perception, do seem to like a scrap - a shame that this one appears to be about the administration rather than the art. The Forward Prize shortlist is the usual mix of the well-known and the new, and you get the sense that "prizes" are now the poetry equivalent of patronage, great if you get them, furiously derided if you don't. Little pleasures continue: there's an Oxfam "book jam" on Sunday night in the Northern Quarter at Apotheca ; there's a competition to write "quickies" (adult flash fiction - that's what happens when you let the Chorltonites into the Didsbury festival! ); the Other Room returns with its packed summer programme, next Wednesday; and Kate Feld is running a workshop on creative non-fiction leading to a competition for this year's literature festival. Our relationship to the Victorians is always an intricate one. We still live in and love many of their houses; we are sniffy about "Victorian values"; we have a Commonwealth when once we had an Empire. Victoria was on the throne for so long, however, that it is the later part of her reign that we are seeing in our minds-eye when something is described as "Victorian." Yet Albert died in 1861, and the museum that bears her and his name, the Victoria and Albert (or "V&A") only took that name at the end of the 19th century. It's an appropriate place for an exhibition on late Victorian art and design. 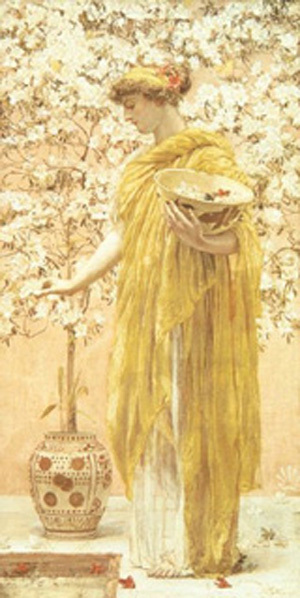 "The Cult of Beauty" is billed as the first comprehensive exhibition of "the aesthetic movement 1860-1900." 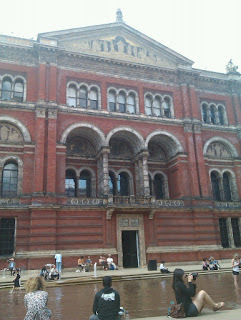 The V&A may well be my favourite British exhibition space, and as ever with their major shows its a curatorial triumph. At its best, the V&A augments its remarkable exhibits with a vast sweep of historiogaphy, and the Cult of Beauty is no exception. From paintings, to artefacts, to a whole range of late Victorian social and cultural histories, the show is in some ways breathtaking. What was the "aesthetic movement" then? This is an exhibition that takes in the Pre Raphaelites, Whistler, Leighton and other late Victorian painters; finds room for designers such as Morris and Liberty (whose shop still exists in Central London), and still find time for the fin de seicle decadence of Wilde and Beardsley. 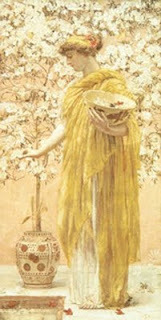 If "The Cult of Beauty" has an agenda it is to revitalise our interest in this familiar, yet increasingly distant time. In parts it succeeds. Our 20th century middle classes are stubbornly enamoured of the late Victorian aesthetic, whether its willow pattern China, or Morris's wallpaper. The examples given throughout the show are luscious, pristine, but at the same time trite. This "aesthetic" was one of a very particular, and peculiar design. New materials and techniques provided artists with the means to produce things of beauty, to their own design; yet this was also a precursor for the "mass produced". The arts and craft movement, as idealised in William Morris's utopia "News from Nowhere", would end up influencing the mass-produced. The four spaces given over to the exhibition take a chronological and thematic approach. The Pre-Raphaelites, though towering over the exhibition in terms of their influence and quality, are seen in the context of their times, their influence extending beyond their own work. But though the exhibition shows their influence, it is not theirs alone. The vivid colours and even more vivid life that we saw in the recent "Desperate Romantics" TV show comes to mind; the set designers of that show had clearly done their homework. 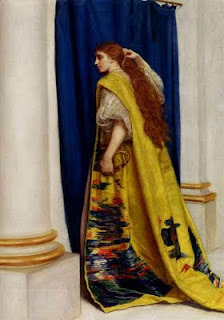 I loved Millais's "Esther", where General Gordon's coat was turned inside out producing the vivid patterns you see in the Biblical character's beautiful gown, and the red-haired heroines of PRB legend return again and again in the art that follows. I was fascinated as well by the story of the Grosvenor Gallery, which was opened as a rival to the Royal Academy and became something of a home from home for the Aesthetic movement. It was here that Ruskin famously slammed Whistler's painting for "flinging a pot of paint in the public's face." This exhibition was full of such historical gems as this - and you realise how febrile the capital's artistic scene must have been during the late Victorian period, even as Victoria herself stayed in secluded mourning following Albert's death. The riches of the Empire were finding their way directly into the homes and tastes of London's middle classes. Whereas the Pre-Raphaelites had worked with carpenters to design furniture to their taste, or had scoured London for 17th century eastern pottery, by the 1880s and 1890s, the wealthy middle classes were keen on showing their own ostentation. Pottery from Stoke-on-Trent emulated Chinese willow patterns; whilst furniture makers and metal workers created elegantly designs. The exhibition even imports a pair of iron gates, which were built to show off the skills of the craftsmen who made them. A reader of Quiller-Couch's first edition of the "Oxford Book of English Poetry" (1900) is struck by how well-formed is the English canon, up to the age which has just finished. Yet the last 50 or so pages of the book are full of tedious versifiers, reminiscent of Tennyson, but without the great man's brilliance. Few survive in our memory. Modernism was not just the period that followed, but a necessary reformation, and the same is true elsewhere in the arts. The natural world is popular with the Aesthetic Movement, but its the peacock that dominates, the exotic beauty of its feathers, becoming a leitmotif, particularly in Whistler's the Peacock Room, which is recreated via audio visual display. One can only admire such attempts at bringing art to the centre of life, but we also see how increasingly these attempts are part of "fashionable society" rather than an art for all. Art for Arts Sake, as Whistler's regular pamphlets would have it, becomes a stick which Punch cartoonists can beat the asethetic movement. In Oscar Wilde, we have both an exemplar of the aesthete and the period's most lasting criticism. Few dramatists are revived as frequently. If Wilde was very aware of the absurdities of the movement, as is clear from "The Importance of Being Earnest", he was mocking his own friends and circle, for the benefit of a wider, more conservative audience. Today, we share the laughter, mocking the pretension, whilst still admiring the decoration. It is the pre-Victorian imagination - the romantic poets, J.M.W. Turner - that still dominates British aesthetics, yet Victorian kitsch casts a long shadow. The "decadent" 1890s end the show. 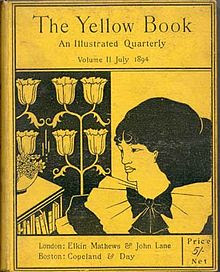 We see revolutions in book design, exemplified by the Beardsley illustrated "The Yellow Book." Here we have a vibrant literary journal, and an enthusiastic educated audience for its writers and illustrators. Yet if, from the distance of a century or more, we are looking for "decadence", its not in the "shocking" illustrations of Beardsley, or stories of the trial of Oscar Wilde, but in the bourgeois sensibility of the times. Wonderful as this show is, I think it falls short of rehabiliting its art. There is something a little too mesmerising about this "cult of beauty", that seems to reflect the technological advances and great wealth of the late Victorian British Empire. You will look long and hard for the real Victorian England, particularly the non-Metropolitan world. Aestheticism brought a certain European sophistication to the galleries and drawing rooms of London, but quickly became commoditised by the class who embraced it - who, in turn, felt morally outraged by the artists (such as Wilde) who had provided their guilty pleasures. For all that Rosetti, Millais, Morris and others were dedicated to illustrating truth through beauty, at some point their innovations became little more than bourgeois fashion. In the end, it is in the history of design and home furnishings that the Aesthetic movememt influenced, rather than the history of art. At its best, the paintings of Hunt and Millais, "Goblin Market", or "The Portrait of Dorian Gray", late Victorian art and literature has a fragile magic to it. It is no surprise that we still admire their buildings, and their interiors. In this exemplary show at the V&A, we see an earlier age of commerce than our own, and the echoes are very clear. Yet we have forsaken beauty for expediency, satire for prurience, Whistler for Emin. The exhibition's title is a clever one for a "cult" can mean two things; an obsessiveness about something which others don't share, and something that appeals to a small group of people. In calling the aesthetic movement "the cult of beauty" the curators of this show are noting only how strange we would now think it to want to design our lives along aesthetic purposes. Modernism, a far more European movement, never really took hold in Britain, as a previous show at the V&A amply demonstrated; and the strong hold that the aesthetic movement still has on our visual imagination is perhaps one part of the reason why. The last of Martin Amis's Public Lectures tonight at the Martin Harris Centre at the University of Manchester was an independence day special, with him being joined by Erica Wagner and Will Self to talk about America. As Ian Mcguire, from the Centre for New Writing, made clear in the introduction, its a big subject. Too big in the end. The big subject was a problem. Amis talked of the discovery of America across the frozen Baring Straits; Self, accidentally given the anti-American role (not really necessary, I thought), preferred personal anecdote to historical relativism, though smirking at the space mission naming of its Atlantis after a mythical, sunken continent, whilst Wagner seemed almost apologetic of her accent; whilst conceding that being an American in England had given her immediate authority on its literature, even if she didn't quite know it. One of her first book reviews was of a Western... so, hell, she'd better know a bit more about Westerns. It seemed a given that we should talk about America in the context of anti-Americanism, the post-9/11 dislike and misadventures across the world. I'd have preferred a debating point on "why America matters" rather than another going over the decline of Empire. Certainly, on July 4th, it was interesting to hear an overview of America that crossed time and nation. There were some interesting points. "America is a world", said Amis, "India is a world, Brazil is a world," disagreed Self, "not America." It could have made an interesting debate in itself, but wasn't followed through. It was, Wagner, I think , who talked about American literature being better for embracing a multiculturalism it had found in British literature. I'd have liked more on that. Is it true that the British + authors like Rushdie and Ondaatje have made America think more about cosmopolitanism? I'd dispute that, but I think she was hitting at a larger truth, that in a globalised market place, authors are now hybrids. Books like "The Kite Runner" or authors like Junot Diaz are American +. But as Amis pointed out, Bellow (as a Jew) and others were always American + anyway. The beauty of tonight's talk, looking back on it, was that there was a certain joie de vivre about it, despite the concentration on America's myopic world view. There were a few open goals missed, I felt. That there's been a Reagan statue unveiled in London today, for instance. The post-Iraq, post-Blair worldview seemed a little too easy. Everyone's a little disappointed in Obama it seems; but Britain, and its own neo-con coalition was not mentioned. Talking about Blair seems easier somehow. Misadventures abroad have longer consequence. Yet, when we did touch on novel writing, the three speakers were mostly acute. The instance response to 9/11 of writers hasn't been that great. As Amis said, DeLillo got terrorism much better in "Mao II" and "White Noise" than "Falling Man." Self's dismissal of Jay Mcinerney's "The Good Life" (though he didn't mention it by name) seemed the wrong choice. Mcinerney tries to incorporate 9/11 into the early 21st century contemporary sequel to "Brightness Falls" and though it does feel contrived in parts, I actually think he is doing the very difficult task of being too contemporary, which meant that 9/11 had to be incorporated. The incorporation seems trite, but I don't think he ever exploits the subject. But that conversation, like a lot tonight, didn't go much further. After all, Amis is one of those who has written extensively post-9/11, and readers of "The Second Plane" are quite rare. The audience questions were, in that uniquely Manchester way, as random as you might expect. I've often felt a "Question Time" format with submission before the event might work well at this kind of event, but, for these public lectures the University of Manchester have stuck with a slightly dull format that could probably benefit, as gracious as Mcguire was, from a more pro-active chair, or a more mediated public response. If tonight felt a bit like a missed opportunity, I don't think the audience were too minded. I didn't recognise a single person from the Manchester literary scene, yet the Martin Harris centre was virtually full. Here, it seems, is a very different audience than you see elsewhere at literary events in the city. The slightly null feeling I had at the end of the evening probably came from this juxtaposition. Finishing his four years in Manchester, Amis has proven there is an audience for this kind of event, and it will be interesting if he's left some kind of legacy on the city, with the students he's taught, the conversations he's had. Perhaps even in what he writes next. With Colm Toibin replacing him in the Autumn there's clearly more than a change of "manager", like when Derby County replaced Brian Clough with Dave Mackay: the styles were very different, but they got a similar result. Manchester International Festival began on Thursday. Counterintuitively I went down to London Friday, as I'd long planned to, to see "The Cult of Beauty" at the V&A (more of which later.) MIF (or #MIF11 on Twitter) isn't a festival that you can take the full two weeks off for, as it would probably bankrupt you. Most people I know have booked for one or two events and will see what else they might catch. Yet there's also a festival pavilion in Albert Square, many of which events are free. So, over the next week or two I'll be catching a few things I'm sure. Its also spurred its own fringe, this time with quite a large, coherent programme. The "Not Part of" festival takes its name from the somewhat dismal community offerings of the first MIF, but has thankfully grown into a welcomed little brother of the main festival. As ever in Manchester, the city is a diverse beast, and events not associated with either festival of fringe are going on at just the same time. So tonight I'll be going to the last of Martin Amis's public lectures as Professor of Creative Writing at University of Manchester.